Anya Ow was born in Singapore and has Hainanese, Peranakan, and Hakka ancestry. She moved to Melbourne and now works in an ad agency as a designer and the chief briber of studio dogs. Anya’s short stories have appeared in Strange Horizons, Daily SF, and Aurealis. Her first novel, The Firebird’s Tale, was published in 2016. “Everything Under Heaven” is her first appearance in Uncanny—a wuxia-inspired tale of dragons, family, and food. Uncanny Magazine: “Everything Under Heaven” has lovely descriptions of cooking, and food is clearly very important to Kee. What is your favorite food- or cooking-related memory? If someone gave you a dragon to cook, how would you prepare it? Anya Ow: I’m from Singapore, which is a very food-obsessed country, so I’m lucky to have a lot of great food memories from there and around the world. One of my favorite food memories involves my aunt attempting to teach me how to make nyonya pineapple tarts. They’re little balls of dense pineapple jam on open flaky, buttery cookie-sized tarts, popular during Chinese New Year. For my aunt’s recipe, the jam is a day’s work by itself. The tart bases get made the next day. Watching her work was amazing. Many of the older women on both sides of my family don’t cook with measurements but by “feel.” It’s magic as far as I’m concerned. Sadly, I still don’t understand how to cook by touch and feel, so I haven’t learned the recipe, but her tarts are my favorite biscuit in the world. The way I would cook a dragon would depend on what it tastes like. If there’s a strong gamey taste then maybe a stew with galangal, cloves, cinnamon, dark soy, and stock. If it’s rich and fatty like some cuts of pork, then maybe a dry roast with crackling. I think if anything a dragon-dinosaur would probably be more like crocodile though, which to me is a weird cross between fish and chicken—if it has a mild flavor then probably just a light stir fry so as not to overwhelm the taste. Uncanny Magazine: One focus of this story is family, and you touch on several aspects of family relationships—Kee’s mother is largely absent during her childhood, her aging father slowly loses his connection with the real world to senility, and Kee herself tries to reconcile her unresolved issues surrounding her mother through cooking. Are family relationships a recurring focus in your writing, or was there something about this particular story that led you to emphasize these relationships? 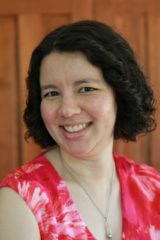 Anya Ow: I wanted to write wuxia-genre story—martial arts, magic/mysticism, adventures—but with a Peranakan twist. I’m part Peranakan from my mother’s side: traditionally the men address themselves as “Baba” and the women as “Nyonya.” Nyonya cooking is a matriarchal cuisine that’s slowly dying in Singapore, with recipes passed down through the family. In my own experience, food is so much a key part of Peranakan culture that it’d be difficult for me personally to write a story with Peranakan elements that didn’t also involve food and family in some way. Also, my family would have reacted to a sudden influx of dinosaurs by wondering whether they were delicious. The proverb that Kee mentions in the story is an actual proverb, one that’s rather accurate for them. Uncanny Magazine: Red Rabbit is an interesting name for a donkey. Is there a story behind why you chose that name? Anya Ow: It’s a reference to one of the most famous horses in Chinese history, the Red Hare, which was owned by a warlord in the late Eastern Han dynasty. It also appears in the Romance of the Three Kingdoms, which is one of the Four Great Classical Novels. If I owned a donkey “Red Rabbit” would be the name I would pick for it. 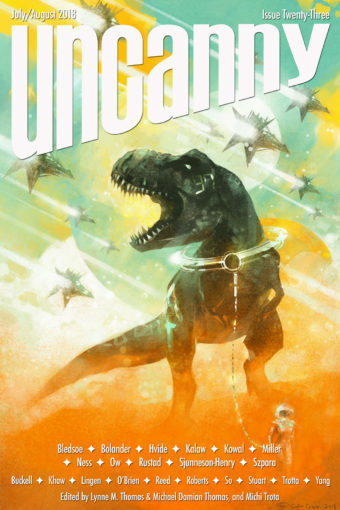 Uncanny Magazine: This story is set in a shared world that features portals and dinosaurs (or, in this case, dragons). How did you approach writing this story for a themed issue? Was it different from your usual writing process? Uncanny Magazine: Kee and Sarnai come from two different cultures, and each of them has heard stories about the culture that is not their own. There were rumors that women from the East were assigned husbands, and that people of the West were barbarians who let anyone good at war live as they liked. This creates a sense of “otherness” from both of their perspectives. You’ve lived in both Singapore and Australia—do you think having ties to multiple countries makes it easier to describe cultures from both an insider and an outsider perspective? Anya Ow: It’s been an interesting experience going from a country where I grew up as part of the majority ethnic group (Singapore is about 76 percent ethnic Chinese) to a country where the ethnic Chinese population is growing rapidly but still a minority. It’s made me more conscious of the personal privilege I have in Singapore, and more conscious of how minority cultures are treated in different countries. Even in a very progressive city like Melbourne, you’d still see some jarring things—there’s a very popular Asian fusion restaurant here owned by non-Asians, for example, which uses Engrish in its branding for laughs. I don’t know if my background makes it necessarily easier for me as a writer, but I try to inform the world-building I put in my stories with the nuance I’ve learned. I’m still learning.